Did you know that much of our modern cereal industry originated with the Seventh Day Adventist Church and its dietary concerns? Charles Post probably thought his life couldn’t get any worse than it was in 1890. At 37 years old, Post was nearly broke. He had invested in a land development scheme and textile mill in Texas, and his health failed. Stomach disorders and nervous problems, with which he struggled most of his life, grew worse after his financial collapse. Perhaps naturally, he also suffered from severe depression. Only on the advice of the relatives did he agree to move his family to Battle Creek, Michigan, in 1891. Battle Creek was home to the idiosyncratic Doctor John Harvey Kellogg, who practiced restorative treatment at the Seventh-Day Adventist Sanitarium. Kellogg, true to his Adventist faith, was a vegetarian and an advocate of the “biologic living”, or what might today be called holistic treatment. Along with his brother, Will Kellogg, John Harvey Kellogg endorsed hot tub bathes, exercise, inspirational talks, and a diet of “natural foods,” especially molasses, fruit and bran. When Post arrived at the sanitarium, he had no money left and had to trade blankets from his bankrupt mill as a down payment on medical costs. Unfortunately for both Post and Kellogg, Post’s health deteriorated further. His wife, in desperation, took post from Kellogg’s sanitarium and put him in a Christian Scientist’s home where he recovered. By that time, Post was nearly 40 and still without employment. He did, however, have something of a reputation as the man who came back from the dead (more or less). Post used that reputation as a basis to start his own health sanitarium, La Vita Inn. Meals at La Vita stressed grain and bran, as well as a coffee substitute made of New Orleans molasses, bran (naturally!) and wheat berries. In 1895, he marketed his coffee substitute to retail grocery stores under the band name “Postum.” He lost $800 on the product in his first year, and still looked like a flop. Post’s breakthrough came when he persuaded a Chicago advertising firm to lend him money for ads in major magazines. He did have considerable writing skills, which he focused on the dangers of coffee drinking, successfully frightening thousands of consumers into trying his product. Post accused caffeine of causing rheumatism, heart disease, blindness, cowardice, sloth, and stupidity! Sales of Postum reached $3,000 a month by 1893, but already he had started work on his next product, a cereal of yeast, whole wheat, and malted barley flour, called “Grape Nuts.” The cereal was not made from grapes or nuts, but its texture was nutty and the banking process turned the starches into a sugar that tasted like grapes. 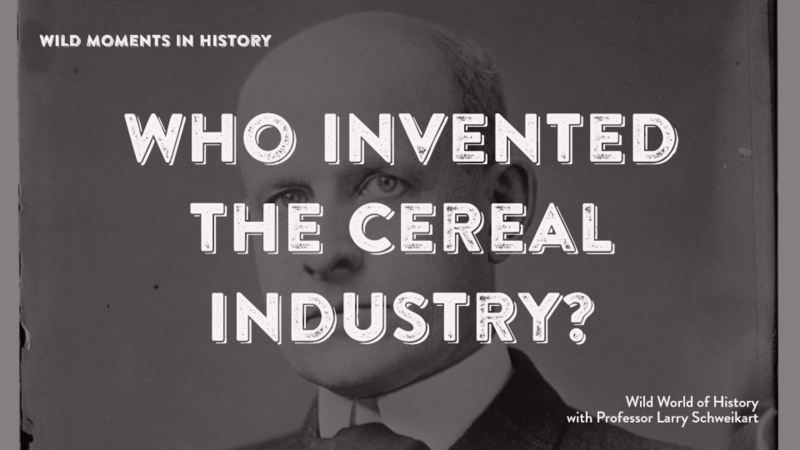 Post sold cereal, became a millionaire in a few short years, and founded a cereal empires. He nevertheless probably would have been chagrined to learn that the company that today bears his name markets such “healthy” products as Alpha-Bits” and “Cocoa Pebbles”—but he may have been relieved to know that nutritional information is mandated to appear on every box, right next to the free decoder ring. For further reading, see Nettie Major, C. W. Post: The Hour and the Man; Joseph Fucini and Suzy Fucini, Entrepreneurs; and Larry Schweikart, The Entrepreneurial Adventure.